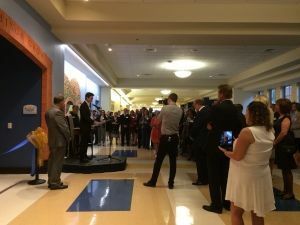 Our largest project ever was dedicated on May 14th, 2016! 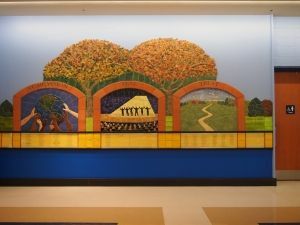 “In Harmony, Small Things Grow”, a 60 foot long ceramic mural forms the grand entry to the new Performing Arts Center at Our Lady of Good Counsel High School in Olney, Maryland. 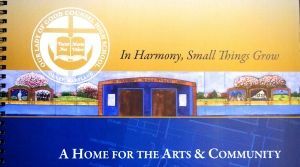 Good Counsel came to us in 2012 before the silent phase of their campaign. Our challenge was to showcase the school’s values and culture in a meaningful work of art that would inspire increased giving. Our design materials formed the centerpiece of their campaign literature. We were informed that the school has a reputation for athletic excellence that has overshadowed their equally top-notch academics, fine and performing arts. This campaign arose from the determination to give the performing arts the facilities and recognition they deserve. 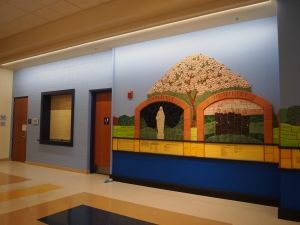 The mural is structured around five arched “windows” each representing one of Good Counsel’s Xaverian values. 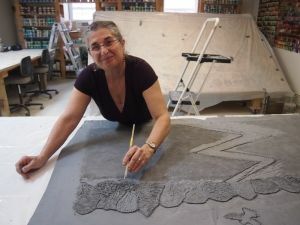 Choosing the imagery for each value sparked a client-artist dialogue about the school’s core identity- past, present and future. The opening events featured orchestral, dance, vocal, and drama performances by students. Their professionalism and passion were truly impressive! I cannot wait to continue to add donor names, and see how the students flourish in this amazing space! Let’s talk about how we could do this for you! Make a phone date – 215-849-7010.